The online retail entrepreneur is worth £300m. 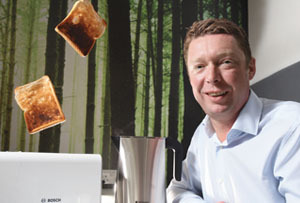 A former sales manager for a fitted-kitchen firm who left school with no qualifications, Roberts founded AO World in 1999 after a friend challenged him to set up a business. The Bolton-based online retailer of white goods, formerly known as AO.com, grew rapidly as a result of its keen pricing and the British love of home improvement. It floated in February with a whopping £1.2bn valuation. Shares have since fallen sharply but the company is still worth £808m. It has produced strong sales growth and now has 24% of the UK market for large domestic appliances. Father of five Roberts says he wants his children to have a 'normal life', so intends to leave the bulk of his fortune to charity.